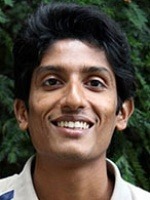 TCi Scholar Vinay Bhaskar, a Ph.D candidate in horticulture at Cornell, is conducting field trials for cover crops that can replenish the Maharashtra region’s rapidly depleting soil organic matter content. Here, he shares some of his experiences in the field. Cotton represents a major crop in India; millions depend on it for income and employment. Cotton fields present a fertile bed for growth of ideas - from the very cropping system to the methods employed for their management - and provide plenty of opportunity to try out these ideas. In the semi-arid tropical region of Maharashtra, current farming practices have led to an alarming decline in the organic matter content of the soil. This has severe consequences for long-term soil fertility, farming sustainability and cotton yields. Key reasons for soil quality decline include: removal of above-ground crop residue during and after harvest and its subsequent use as animal feed and fuel; high summer (February to May) temperatures (as high as 48C); severe dryness resulting in an almost total absence of vegetative cover; and frequent and severe soil disturbances. Opportunities exist for re-introducing organic matter and positively contributing to soil stability through cover cropping. 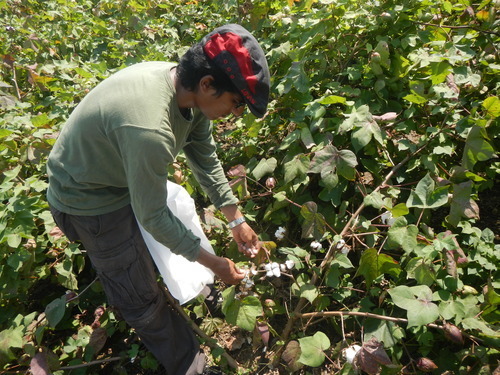 My Ph.D. work has centered around the development of field trials meant to introduce viable varieties and methods useful for inter-cropping cover crops that can contribute to long-term soil stability and weed suppression in the cotton region of Maharashtra. I chose two trial sites in the first season and four the second season. Currently, I am in the second season of trials with one of these trials being carried out at a research farm at a local agricultural college (PDKV) and three other on-farm trials. Seven species of cover crops have been studied so far, with five this season. The most promising ones appear to be sesbania (Sesbania sp. ), gliricidia (Gliricidia sepium) and sunnhemp (Crotolaria juncea). In a farming culture that we perceive to adhere tightly to its conventions, I have, many a time, had growers give me a free hand in the patch of land they have lent me for my trial, while they watch my activities with detached interest. I appreciate the leverage given to me by the growers, knowing full well that my trials involve abandoning many activities that they hold necessary, such as inter-row hoeing with bullocks for weed control, an activity that is carried out with much fervor. Surprisingly, many times I found the growers to have an open mind and analyze the methods that we advocate very objectively. Field work here is exciting (except the days when it is so hot you have to carry bottles of ice instead of water and you are more dehydrated than military ration before you even reach the field) and you always have new things to experience or experiment. I enjoy trying to make operations more convenient, and we have been able to build new equipment and modify others using locally available material. The town has its share of good blacksmiths and carpenters who are always ready to help in my next crazy endeavor. Spending such a long time in this place has provided me with new experiences at different levels - some good, some fabulous, some not great. Agriculture in this region is different from what I have seen in other parts of the country. There is not much diversity in the crops cultivated, and many growers have considerable sized farms. There exists a fair degree of mechanization in agriculture, but it is still amazing to observe how much can be achieved through manual labor. Here, trying out new ideas is fairly convenient, though a cause for frustration is not being able to do something how or when you want to do it. This is only partly because of the behavior of the soil; due to the high clay content, the fields become literally ‘unsteppable’ with the slightest rain and become sticky enough that you are stomping around with 10 pounds of mud in each foot by the time you commence work. Excessive and continuous rains this year have delayed the harvests of cotton, and with the recent cyclone it is expected that there might be another spell of rains here. But, for now, the past several days have been hot and it will be time to pick cotton bolls soon.